At Holy Protection Monastery in Kiev, under Metropolitan Vladimir of Kiev, Abbess Sophia Grineva was numbered among the saints of the Church in an official canonization. Her feast day will be on March 24th and April 28th (the day her relics were found). See photos of the canonization here. 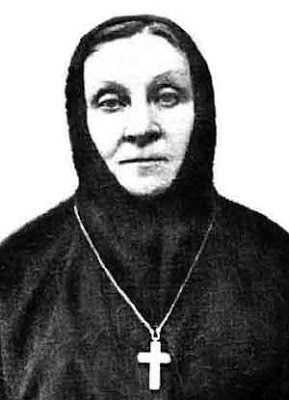 Abbess Sophia (Grineva) was born in Moscow in 1873 in an ancient and wealthy landowner's family. The father of Sophia Evgenievna was a lawyer and served in Belev, Tula district. When he died, the children stayed for a while in the convent of her native town of Belev, which was under the spiritual direction of the Optina elders, and whose abbess was their family's former governess. "What an abbess she will be!" And another elder who lived in silence in the woods bowed at Sophia's feet. "Don't give your daughter in marriage. Today I had a dream: in the iconostasis instead of the Mother of God was your daughter." It is well-known that abbesses are considered the deputies of the Mother of God. Not far from the Grinev estate lived a wealthy landowner, Znamensky, whose daughter Anna Zakharyevna, having just completed her higher education, abandoned all thought of an upper-class career and, out of religious zeal, preferred to become a village school teacher. Being aflame with monastic striving, she would give spiritual lectures with the singing of akathists, ending late at night. These were attended by more than 400 people. Anna and Sophia became close friends. Late one winter evening, going through the deserted woods to Anna's lecture, Sophia encountered a wolf, and her death seemed certain, since these beasts, who plagued this territory, were not only cattle-killer, but had recently even killed an armed officer. Here she made a vow to become a nun if she remained alive. She made the sign of the Cross over the wolf, and at once he ran away into the woods. Just before graduating from the conservatory, when she was 22, Sophia fell severely ill with anginal dyphtheria and lost her voice. She was in despair. The doctors suggested that she had tuberculosis and advised her to go to Davos in Switzerland. By that time Anna had asked and received her share of land from her father's inheritance, and together with ten other young women she settled in a remote and deserted wooded area, founded a community dedicated to the Holy Trinity and began to lead a severe monastic life with the blessing of several holy men: St. John of Kronstadt, Elder Ambrose of Optina, Elder Barnabas of Gethsemane skete and others. While waiting for a warm house to be built, the sisters lived in tents in huts made out of branches and boards, slept on the earthen floor with a rock for a pillow, ate dry bread, and only on feast days had some warm weak barley soup. They felled trees, chopped firewood, dug a well and built a beautiful church dedicated, where they conducted the whole daily cycle of Divine services. The community flourished, with over 600 sisters, an orphanage, an old-age home, a large vegetable garden and orchard, a brick factory and metochia in Moscow and St. Petersburg. However, Matushka Anna, overwhelmed by her success, suffered a grave spiritual catastrophe: she was lured into spiritism and left the convent. Dissension struck the convent, and some sisters left. Sophia went to a holy elder, Gerasimus of Kaluga, who had just opened the St. Nicholas convent for his spiritual daughters. However, Sophia incurred the dislike of the treasurer of the convent because she read spiritual literature to the sisters and they loved her. Soon she and Mother Catherine Metzendorff, who had also left the Holy Trinity community, left the St. Nicholas convent and went to found an independent community. On the bank of the beautiful Oka river there was an abandoned church of St. John the Almsgiver with an icon of the Mother of God called "Joy and Consolation". There, in a place called Dugny from the river which flowed into the Oka at that point, the young sisters settled in order to continue their narrow path of poverty, daily church services and labour. But there was also a factory there, where former convicts worked. At first they did not like the nuns and caused them many vexations. But the community quickly grew to number 170 sisters, monastery buildings were constructed and the church was repaired. And a refuge for 30 children was built. Finally, Mother Catherine wrote that life in the community was in disarray and that Mother Sophia should return, while she herself would go away. That is what they did. Mother Catherine founded a community near the town of Bologoye in Novgorod province, dying there at the age of 95. Life was difficult in the new community "Joy and Consolation". Nuns often came to matushka to report that there was nothing with which to feed the sisters and children that day. But every time Mother Sophia convinced them that the Lord would not fail to come to their help, reminding them of previous examples of miraculous help from on high. Candles were lit at the foot of the Crucifixion in her cell, matushka and her nuns began to pray, and their faith was never put to shame. The following great miracle took place. 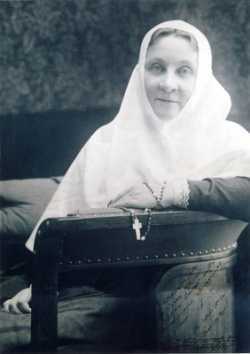 Mother Sophia constantly lobbied for the legal confirmation of her community. And then an order was received from the Holy Synod commanding the community to contribute 4000 rubles in a very short time for the 47 desyatins of land belonging to the church of St. John the Almsgiver. Without this the community could not be confirmed in law. Matushka gathered the sisters into the church, explained the situation to them and placed the order paper before the icon of St. Seraphim. A prayer service with an akathist to the saint was served. How many tears were shed then! Two days later, an unknown wanderer appeared and brought an envelope with 4000 rubles and a request that they pray for the virgins Elizabeth and Anastasia. It turned out that this wanderer had been present at the reading of the akathist and had turned to some benefactors whom he knew and who trusted him. In this way the community was saved. The spiritual life of the community was centred on the church, which was poor, but always clean and decorated with great taste. The iconstasis was modest, but artistically worked. On the glass of the altar window was painted an icon of the Resurrection of Christ, which was illumined during the triumphant services. During the polyeleos candles were handed out to everyone in accordance with the custom of the Kaluga monasteries. Then matushka was given a dish pieces of bread cut during the litiya, and she went round the parishioners with them. They loved her and went to her with all their troubles. When, at the end of the service, the children were led away to sleep, matushka blessed each of them, and in turn bowed to each of them to be signed with the sign of the cross. Matushka also took loving care of the church cemetery, and on appointed days lampadas were lit on the graves. By her faith and love for God matushka strengthened the desire of the nuns to serve Him with all their heart and fulfil His holy commandments. The spirit of the community also had a powerful influence on the laypeople who came into contact with it. Unbelievers who came to the community often became believers, and there were cases when they entered the number of the monastics. Many of the simple people left a secure life in the world and entered the community as workers. All the traditions that matushka introduced into the community were kept sacred even when she had left it against her will. Meanwhile, matushka had to suffer a severe trial. For a long time no priest was appointed for the community. Finally, he arrived. To the horror of all he turned out to be an alcoholic. Moreover, he had a terrible character. His own family had left him. He beat the old novice who had been attached to him, and during the services he loudly and indignantly swore at the sacristans and chanters. But matushka firmly told the sisters that since this had happened with the permission of God, and that this priest had been sent to them, their duty was to respect him for the sake of his rank and not be led astray by his weaknesses; she besought them to be patient. The sisters, as ever, received these words of hers with complete trust. Once she saw in a dream that she was rising higher and higher in the air and bringing this priest with her. From this she drew the conclusion that he had not been sent to her for nothing. Meanwhile, the situation became more and more difficult. The priest hated her, he searched out two or three dissatisfied sisters, set them as a faction against the superior and began to write complaints against her, which was unheard of in that peaceful community before then. Mother Sophia only prayed for him and demanded from the disturbed sisters that they endured everything. However she did not find it in herself to have confession with him. But this priest did have one great quality: he prayed sincerely and loved to serve the Liturgy. Once Mother Sophia suddenly fell seriously ill, and in the night they had to call the community's priest to give her the last rites in case she died. Then something unexpected happened. While going to her, the priest stumbled and dropped the Holy Gifts. This accident elicited such sympathy and compassion from matushka that the priest's eyes were opened and he saw her in a true light. According to the rule he had to report the incident to the bishop. The bishop sent him to a spiritual father. He returned a completely changed man, and declared that he would go to Fr. Gerasimus for correction. "My Misha will be higher than I." He commanded him to found a community and refuse nobody entrance into it. In fulfilment of his elder's command, Fr. Gerasimus found the St. Sergius skete. There he received both helpless sick people and cripples, and the spiritually sick, fallen people who required spiritual regeneration and correction. The healthy looked after the sick and crippled. The monastery was exemplary. The outpouring of Fr. Gerasimus' love was striking, it had no bounds and was capable of regenerating the hearts of men. He was spiritually close to Mother Sophia, and they sent each other their spiritual children. In accordance with the grace given him, Fr. Gerasimus was a clairvoyant elder. It was in this "hospital" that the priest wanted to go for repentance. There he became gentler, was completely cured of his alcoholism and asked to go back to matushka. But she was already in the Kiev Protection monastery. It happened like this. The Kiev Protection monastery was founded at the end of the 19th century by Nun Anastasia, in the world the Great Princess Alexandra Petrovna. The monastery was very large and its administration very complicated. It contained cells for 1200 sisters, a large hospital in which female student medics practised, a refuge and a work-house. The abbess had to deal with various people: with the Great Princely family, who considered this monastery their heritage; with the builders of the huge, as yet unfinished cathedral (besides which there were several churches); with the doctors of the hospital; with the members of the city administration; and with many others. The book-keeping section was huge. Besides, the elderly inhabitants, who were used to the wise direction of the holy eldress Anastasia, did not get on with the superiors, and they often changed. Metropolitan Flavian of Kiev was at that time in Petersburg, in the Synod, and Matushka Sophia visited him in connection with her own affairs. He was carefully looking for an abbess for the Protection monastery. Now there stood in front of him a young, sensible, clever superior of a community she herself had founded. His choice fell on her. They did not at that time suspect what a find they had made, what a pearl they had caught. Mother Sophia wept the whole night. She had grown in soul with her community, with the monastic sisters, with the children whom they supported, with the laypeople who settled near it, with the simple people who entrusted her with their troubles. They were digging her out as one digs out a tree with its roots. She was then a rasophor-nun. She was tonsured into the mantia and raised to the rank of abbess in the Novodevichi monastery. She kept the name of Sophia since that is what she was called on all business papers. This took place at the end of 1912 or the beginning of 1913. "This is a kind of foretelling of prison." And so it turned out: when Bolshevik power was established in Kiev, they dragged her out of the monastery into prison. By her exceptional kindness, humility and simplicity, Abbess Sophia won the hearts of the sisters of the Protection monastery, as she had those of the "Joy and Consolation" community. Everybody loved her. She did much; she was generous to the poor, none of the needy left her without help, she never refused to support anybody. It was a great consolation for her that she could now help her beloved "Joy and Consolation" community. Another consolation was that the sisters who were closest to her moved to Kiev with her. Closest of all to her was her faithful assistant in "Joy and Consolation", Mother Martha, who became her senior cell-attendant. She shared with matushka all her sorrows in the Bolshevik period, and died as Schema-Nun Margaret. Everybody in the Protection monastery loved her: both the capricious old women, and the children of the refuge, who met her with joyful cries. This is where the revolution found her. And Mother Sophia was soon called to suffer for the faith. The Protection monastery was closed earlier than the others, and Mother Sophia was taken away to prison, being transferred from one to another. Being a true offspring of the Optina elders, with whom she was in constant contact, she soberly discerned the true nature of the Soviet revolution and knew what to expect from it. Thus when the assault of the "Living Church" struck, her convent was one of the first to give a blow back, although she herself had already been arrested. A new calendarist bishop was forced into the convent by GPU agents to serve the Liturgy. When the women who attended it came up to kiss the Cross at the end, one after the other they spat on the bishop's hand that held the Cross, and thus put an end to "renovation" in the Protection convent. The bishop learned his lesson and repented. "If it were not for the women, who else would defend the Church? Let them at least defend it however they can!" In 1926 Abbess Sophia was released and lived 25 versts beyond Kiev. Then she returned to Kiev and settled with a relative of hers near the Protection convent. In 1927 there was published Metropolitan Sergius' notorious declaration, which betrayed the Church into the hands of the atheists. Mother Sophia and her clergy, led by the young protopriest, Fr. Demetrius Ivanov, were the first ones in Kiev who openly rejected it. Unfortunately, they were supported by few of the other clergy, while most of the local bishops were silent, in effect accepting the declaration. The convent was confused and divided because of this, and Abbess Sophia thought it wiser to leave the convent with Fr. Demetrius and twenty sisters of like mind. The other nuns did not divulge her whereabouts. A wealthy lady, Mrs. Helen Alexandrovna Babenko, offered her summer house in the Kiev suburb of Irpen as a refuge for the confessors. There Mother Sophia lived with Fr. Demetrius and his family. The other nuns lived in private houses nearby and at night gathered at her side for services. At this time a miraculous spring was discovered nearby. Living there, of course, was not easy, for an intensified persecution was being directed against all Josephites. In the house there was a hall adorned with paintings. At night they were taken down and replaced by icons, and all night long fervent prayer was offered in special vigils. In the morning the paintings were replaced, and no outsiders could know that this was a catacomb church, which served as a spiritual centre for the True Orthodox Christians of the whole Kiev area. "None of our people have any contact with the doctors of Sergiev, and we do not go to his clinics for treatment. He has acted completely illegally, since the old man, Dr. Petrov, only assigned him as his replacement for current business when he had to go away, but Sergiev, without a consultation of all the doctors, took over the administration, which he directs in all matters. The old men Petrov and Kirillov do not recognize this administration, and both of them are in persecutions and sorrows. My husband was very upset with the activities of Dr. Sergiev, because all the zealots of homeopathy [True Orthodoxy] are deprived of the possibility of treatment, since all the drug stores are in the hands of those who have taken over everything. It is difficult to explain to you, but if you know everything, it is unacceptable. I will tell you one thing: I was in Chernigov the whole time without a doctor and travelled to Kiev [Mother Sophia] when necessary, that is, once or twice a year. The children have also not gone for treatment here." The leading anti-sergianist in the Kiev area was Bishop Damascene (Tsedrik) of Glukhov, who was spiritually very close to Abbess Sophia. He wrote flaming appeals showing the ruinousness of Metropolitan Sergius' policy in every aspect. His stirring appeals were secretly copied and re-copied by Orthodox zealots, and some of them reached the free world, where they were distributed. His deep concern was for the future of true, unadulterated Orthodoxy in Russia, a concern shared by his friend, Abbess Sophia. He was often arrested, released for a while, and then exiled again. Once, in 1934, he visited Abbess Sophia when she was also free from prison for a time, and tonsured her into the Great Schema. In 1937 all the members of the Irpen community except Abbess Sophia, who had already been arrested, were arrested and exiled to an island in the Kamchatka area in the Far East, where they were placed in a collective farm that raised reindeer. Mrs. Barbenko, who became a nun, sent word from there, but when they sent a letter and money there, they did not receive a reply. In her telegram Helen Alexandrovna had said that they had been conveyed on a steamer for several days. Thus did the Irpen community of True Orthodoxy come to an end. Abbess Sophia was arrested before the rest of the community, and so she was not sent with the other sisters to the Far East, but was thrown from one prison to another, mostly in European Russia. Her sisters here and there managed to keep watch over her, until finally, as a result of the inhuman prison conditions, she contracted bronchial asthma and other serious ailments, and was released to die. But while in prison she was not harmless for the God-hating Soviets. Judging from an earlier encounter she had with one convinced atheist, she must have challenged the beliefs and prejudices of materialists in the prisons, shattering to pieces their philosophical inconsistencies and thus bringing their souls to God. Once, before the revolution, a lady who knew Abbess Sophia's deeply-rooted understanding of the Orthodox world-view, implored her to influence her son, who was a convinced atheist. This man, exceedingly brilliant and talented, was making an enviable career for himself in engineering, and would not yield to anyone's persuasion. Mother Sophia talked to him about religion, but he resisted her words, although she did manage to talk him into going to Sarov monastery; she herself also went there at this time. The duel between the holy nun and the atheist was not an easy one, but by her holy prayers some miracle took place, which shook the engineer to the depths. He not only became a believer, but was truly reborn spiritually. His former life disgusted him completely, and he could not endure to continue it. He left his job, abandoned everything he had, put on simple peasants' clothing, and set out on foot for Solovki monastery. The former atheist became a pilgrim with the Prayer of Jesus on his lips. On June 15, 1941, Abbess Sophia's sister, Maria Evgenievna Popova, who was living in Paris, received a letter from N.A. Grigorievna, one of matushka's spiritual daughters, informing her of her sister's death on March 22 / April 4 of that year. The last morning in the much-suffering life of Abbess Sophia arrived when she was amidst her spiritual daughters on a collective farm near Serphukhov which was a catacomb convent. She was in a state of absolute exhaustion, not having partaken of any food for several days. After morning prayers, when her room had been put in order, Mother Sophia asked to be left alone, and then began to read her favourite book, the Gospel. Then the sisters heard her coughing and gasping for air. The agony lasted for three hours, but she was fully conscious and her eyes were clear. Then she turned her gaze to an icon, closed her eyes for the last time, and departed to the Lord.